Description: Open erect shrub usually 1–2 m high, not rhizomatous. Leaves spreading to widely ascending, straight, not crowded, single or occasionally in loose clusters of 3, linear to very narrow-elliptic, mostly 5–9 cm long, and usually 1–3 mm wide, margins shortly and angularly once-refracted; upper surface usually punctate, midvein and intramarginal veins prominent and faintly granular; lower surface partly exposed, subsericeous. Conflorescences terminal, erect or often decurved, borne clear of the foliage, shortly and broadly secund, many-flowered. Perianth white with brown hairs on limb, or rarely tinged pink, subsericeous outside, profusely bearded inside. Gynoecium 7–13 mm long; ovary stipitate, glabrous; style white becoming reddish minute papillae in apical 1 mm; pollen presenter oblique. Flowering: Flowers mainly August–Dec, sporadically January–May. 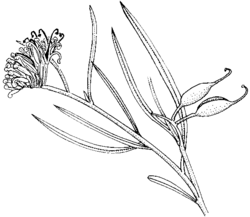 Distribution and occurrence: Grows in dry sclerophyll forest or heath, mostly in well-drained semi-shaded to open sites, mostly in sandy soils over sandstone; widespread in eastern N.S.W, from Gosford and Putty area to Parramatta River and Port Jackson, with disjunct populations in the Lower Blue Mountains (Lawson area) and inland from Ulladulla and near Nowra.